Raise your hand if you read the Sartorialist. That's where I found my inspiration this week for Project Run and Play. I saw this orange beauty of a dress and knew that's what I wanted to use. With Pearl, my only redhead, as my muse, I. Had. Fun. and used some orange trim I've been saving for such an occasion as the "collar". and added some fun touches for pop. One of "my" sweet young women from church came up with the name for it meaning Orange Flower in French. I just might start calling Pearl my Fleur D'Orange :). Go over and vote for your favorite look. i am so glad i started following your blog - you are such an inspiration! Katy, simply stunning! This is why God gifted you these gorgeous girls, to work your artistic talent. Oh to be the girl who's mommy dolled her up in such magnificent treasures. Thanks for the inspiration. Oh Katy, you won my heart again! Oh Katy, of ALL the dresses and outfits you've pulled together, this is by far my favorite. I love every single thing about it. I am smitten. Oh my goodness! I just checked out the others and LOVED yours the best. In my mind it wasn't a contest, but then I love orange and turquoise together. Waiting on pins & needles to find out if we get a tutorial of this. I have the perfect orange fabric to use too! Katy I love this dress! I love the way you mixed patterns, added the faux placket, and the gorgeous waist band. Lovely pictures too! Although I do love your unique style, my favorite thing is that you sew with quality. I have a major pet peeve about how much stuff out there is just so poorly sewn, but your stuff always looks well made and crisp! Wow. Wow. Wow. Beautiful colors. I love the juxtaposition of the orange and teal. Katy it is beautiful! You did a fantastic job! Love it. katy- I LOVE this one. seriously, LOVE it! orange and aqua are such a great color combo. I love the way you made the back of the dress your own, too! :) lovely as always. Pearl wears it so well! Love the colors and attention to detail! It's fantastic! I just went over to ProjectRunandPlay and I don't understand why you're not winning this one by a landslide. Seriously. This is the most creative, inspiring and happy dress I have seen in awhile. And probably my favorite piece you've done on your blog since the "2" dress for Clover. The colors are a perfect mixture. The execution is flawless. Maybe I love it just because I'm a redhead too and I secretly want one in my size, I don't know. The collar is perfect. Well done, Mama Dill. And is anyone else as amazed as I am that you are doing this while still keeping up with school lunches, homework, permission slips, dinner, extracurricular activities, etc. for the Baby Dills? Wowee, I love everything about the dress! Completely and unabashedly in love with this one Katy! This is the dress I voted for earlier! I love the colors together, not something I would have considered, but they are so amazing together. Great job! You've got to win!! so retro cool! i would definitely wear that. Absolutely gorgeous! Can you share where you got the fabric from? I love the combo, it explodes! How gorgeous is Pearl and how sweet is her smile in the last photo? Your albums are just a treasure trove. I am in love with this dress!! Love the beading... you are so smart! Off to vote, but first wanted to say what a beautiful talent you have. I have not seen one of your pieces that isn't just fabulous. Thanks so much for sharing it with the rest of us. I looooove the color combo! So gorgeous! This dress is beyond gorgeous (and so is your daughter! But being a redhead myself and having two red-haired daughters, I am partial :) Orange and turquoise are my two favorite colors together. LOVE this! I think that this is just wonderful! I love the neckline detail and the beading! OK, I just think the whole dress is wonderful and so are all the pics! I really love how you captured the sweetness of youth in this dress even though it is adult-inspired...i love everything about it! Katherine G-Thank you!! I feel like I take great pains to pay attention to details that sometimes aren't even seen. I like to make sure it looks like I really put my best effort into my items, so thank you for noticing. Oh BEAUTIFUL! The girl AND the dress! I do so love The Sartorialist -- except that he only photographs women that are super duper skinny. I get the models, but he can't find ONE stylish woman on the street bigger than a size 4. Really?!?!?! I'm just in awe!! The dress is just stunning! Love reading your blog and just wish we lived next door and could be neighbors ( : Can't wait to see what pops up next! Gorgeous! Everything about this dress is stunning. The collar and ribbon really make it something special yet so wearable. Some of the others in the competition are just way over the top and completely impractical!I hope you win-you definitely deserve it! How I wish I were just that size and a millionaire so that I could give you lots of dollars for that dress. I LOVE IT. Everything about it: that collar, the curved hem. You are so talented! Gorgeous! The trim, the bely, the colors, the beautiful model! You are so talented and your blog is so inspiring!! 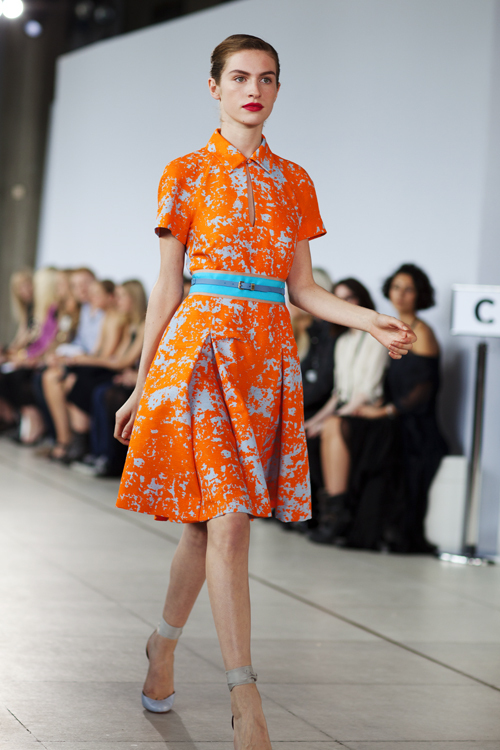 I love orange and turquoise together and this dress is a stunner. where do you find the time for all of these details! ?